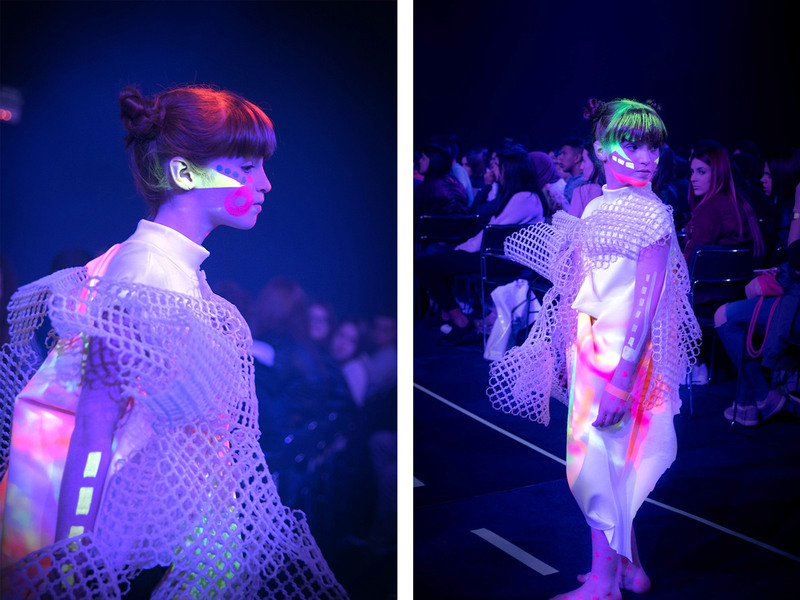 ECOcyborg is a fashion tech show created by Alex-Murray Leslie and the students of the IED (Istituto Europeo di Design) Barcelona. 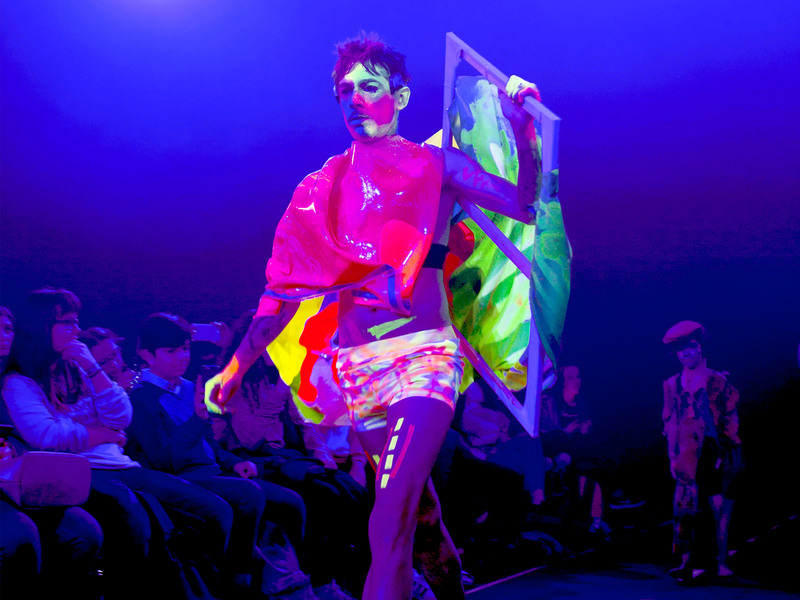 This artistic performance is about the impact of technologies in our way of creating, producing and consuming today. The show took place in the Youth Mobile Festival (YoMo) during the Mobile World Congress 2017 (27 February – 2 March) in Barcelona. 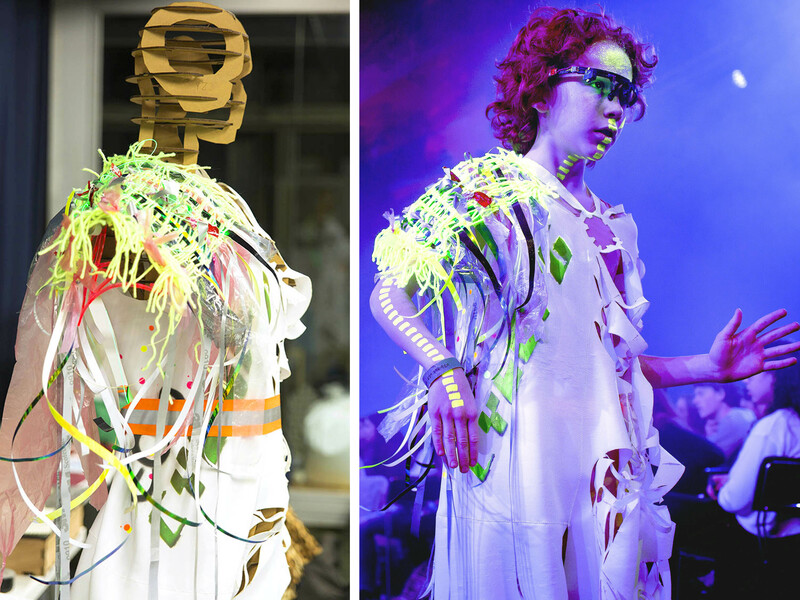 During the last two months, the team of FabTextiles collaborated on this project by designing and producing materials used for making the garments of the show : bioplastics, 3d printed fabrics, thermoformed acrylic masks, laser cut textiles, weaving with electroluminescent threads… Alex-Murray Leslie (founder of Chicks on Speed, an internationally renowned art band) during the performance “ECOcyborg” at the YoMo Festival 2017. 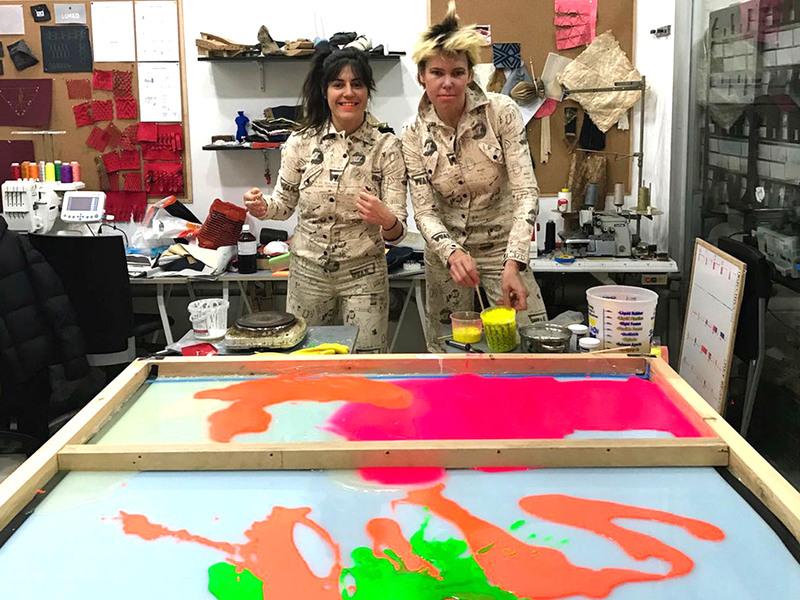 BIOPLASTIC WORK : USING BIODEGRADABLE MATERIAL AS A FABRIC (You can find more information about bioplastic in this previous post → The secrets of Bioplastic) Anastasia Pistofidou and Alex-Murray Leslie creating bioplastic in FabTextiles and Materials Lab. We cooked a huge quantity of bioplastic with gelatin base for making a flat piece of 2000×1500 mm. Adding ultraviolet colors pigment inside the mixture to make the bioplastic shining in the dark. 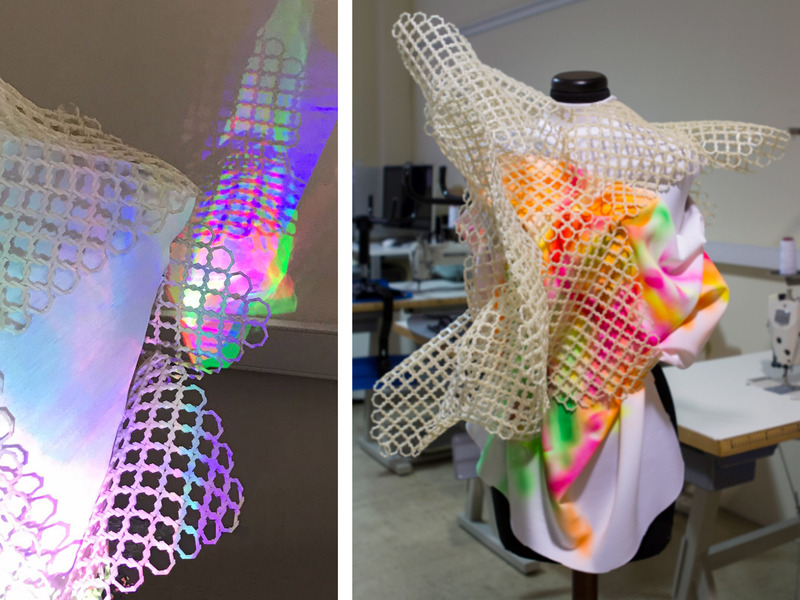 This bioplastic piece was used by the students of IED Barcelona to create a futuristic shirt for the show. 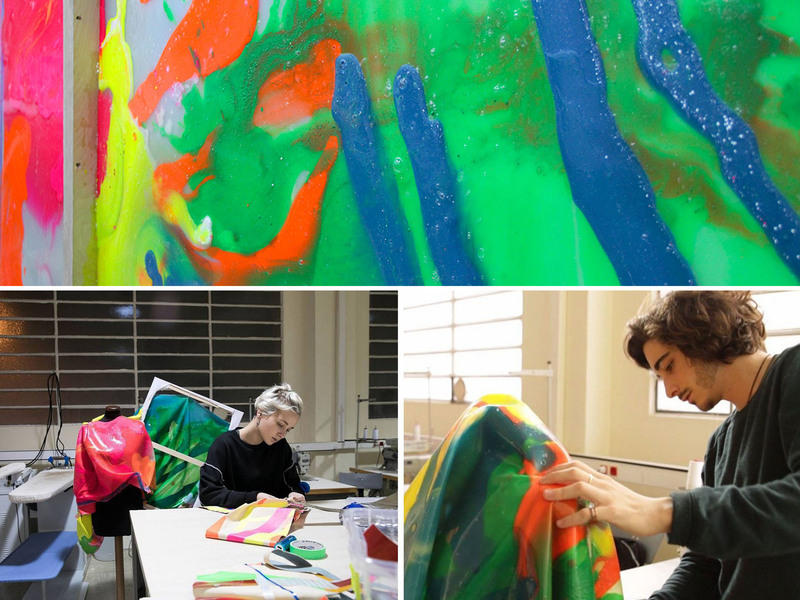 Anna Masclans, a student from the IED school interning in the FabTextiles, create a new type of material by combining wastes of fabrics with bioplastic. 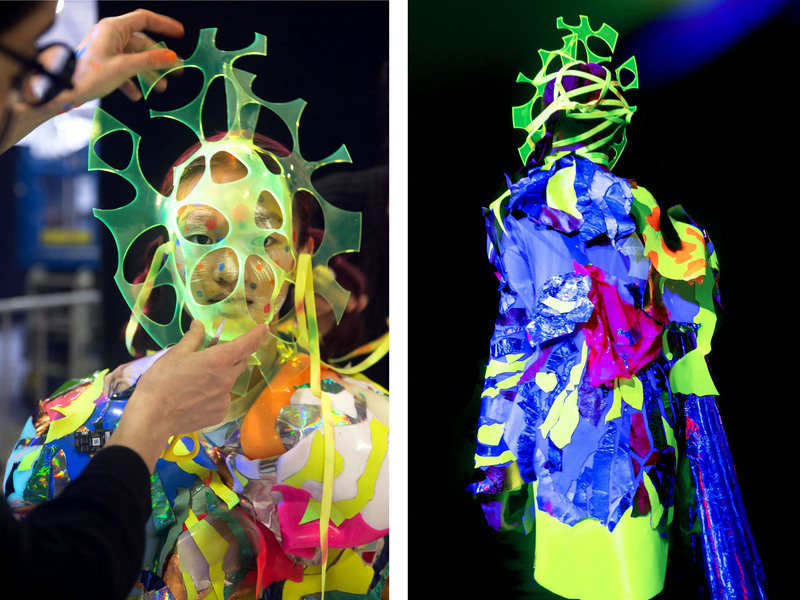 A nice way to recycle the textile leftovers when people make garments inside fashion schools. Her samples were used as patchwork for one look in the show. 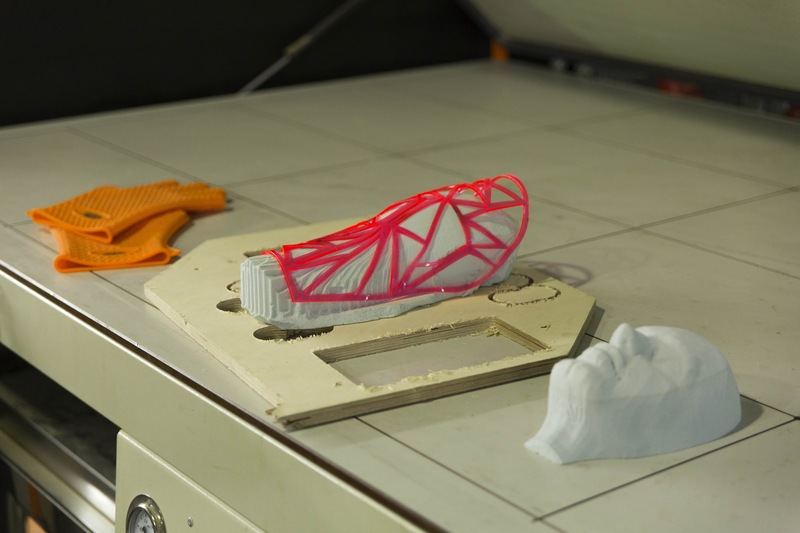 Anastasia Pistofidou design on the software Rhinoceros and Grasshopper a chain for printing in 3D. The 3D printed chain like textile allows to print a pattern made of small rigid volumes that assembled together becomes a flexible material. The students from IED Barcelona took the chain for making the coating of a dress. THERMOFORMED ACRYLIC : It’s possible to deform an acrylic sheet by heating it up to 160degrees and using a vacuum forming machine. You can give to the acrylic sheet the shape you want by using a mold. For creating those thermoformed acrylic masks Anastasia Pistofidou 3Dmodel a human face made in MakeHuman software. The next step is to CNC mill the piece of PU high density foam (can be negative or positive. After, the 2d pattern is laser cut on an acrylic sheet of 3mm and finally heated-up and placed it on the foam face and put it under the vacuum forming machine. WOVEN ELECTROLUMINESCENT THREADS : During the last day of the Textile Bootcamp Academy, a group mentored by Alex-Murray Leslie developed a woven piece that embedded Corning Fibrance Light-Diffusing Fibers from Versalume, reflective textiles and recycling elements like plastics bags and packaging papers. 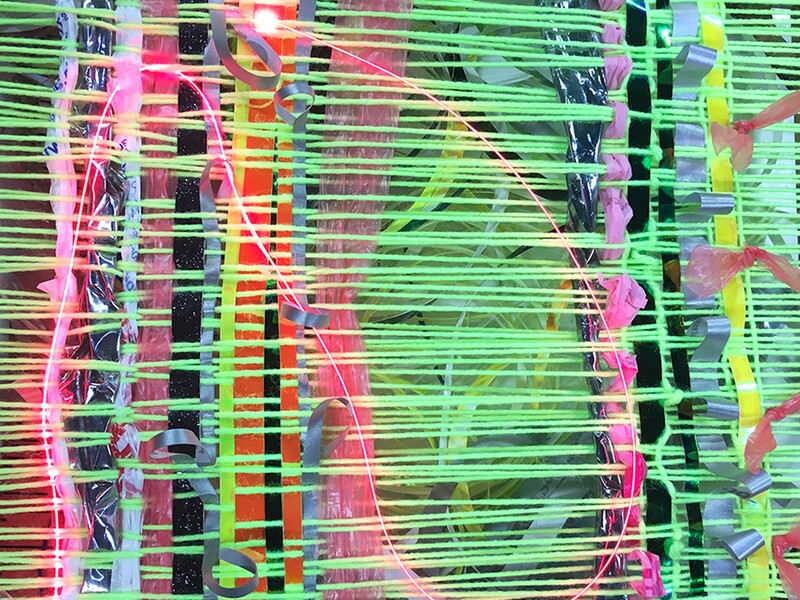 The loom used for creating the weaving was laser cut and built in the Fab lab from an open source file found in instructubles. The final woven piece became a shoulder piece inside a laser cut petticoat. 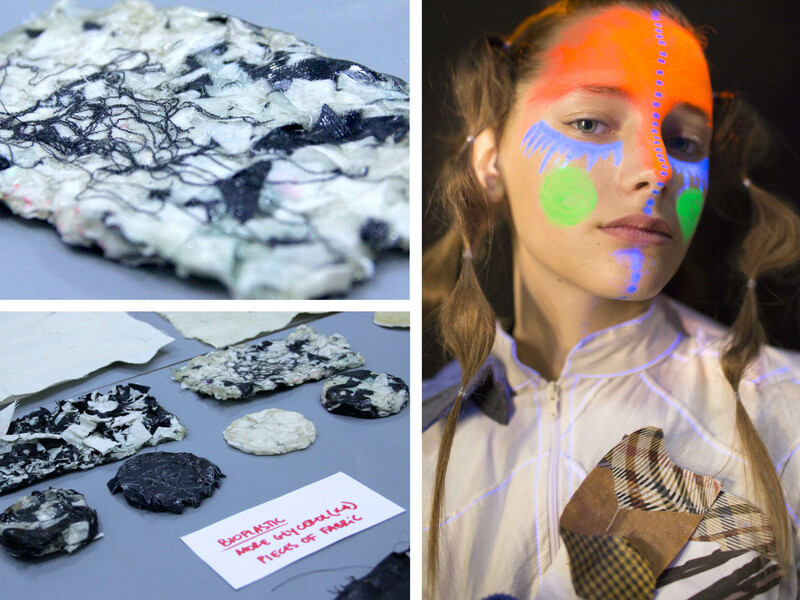 Inside the FabTextiles Lab we question ourselves about the future of textiles, technology and try to find hands ON ways to change the fashion industry. We using technology to create our own tools and discover new materials.